Hey guys! Sorry for the radio silence, but I’m back with a burning question. You guys had such great feedback on the last post (and I’m behind on responding to comments! ), and now I need your vote on which vanity to choose for the master bath. I’ll be buying the vanities on Monday or Tuesday – in the meantime, help a girl out! Which should we go for – white or white oak? The oak adds warmth, that’s my vote. Another vote for white oak!!! Too stark and modern the other way (and cold). The white oak warms things up much more. Also, I found the bamboo hooks alone in the first vignette but they definitely work and look at home in the second with the white oak. It adds some much needed warmth. And ties in the rope a bit from the mirror. I really like both of them. Either one of them would look awesome. However, I think the white is more modern. The white oak will add a litlte bit of warmth to the room. I also think that it fits better with the industrial look that you are going for in the rest of the house. I can’t wait to see the final results! White oak. It brings in more texture and less of a sterile feeling. It also goes better with the captain mirrors. I love it! White oak! It looks warmer. white oak! I love the warm texture paired with the clean look of the white tile, sinks and glossy finishes. If you’re going for a modern/rustic/industrial vibe, you’ve nailed it. The white on white would be beautiful for a more urban setting or modern all around. White oak!! Perfect wood to white combo…. White Oak! The wood brings warmth, texture and the industrial edge. My vote is white oak! Oak! I love the warmth of the wood. white oak. Warms the other items. The white is just too stark. White oak no question about it. This is tough, because I think I actually like the white better, but the white oak (which also looks great!) fits the design scheme of the whole house better, so that would get my vote. I love the white. It’s so classic and clean! That particular white looks too glossy. If the white was more matte, then I might lean white, but I’m going to vote white oak. white oak — provides beautiful contrast to the rest of the white/gray/black. beautiful! White oak. Brings some warmth and looks more modern. I really like the White Oak, especially with some black accents. Would be so fun as a home buyer to work with colors to go with the whole ensemble. I remember someone in a previous comment say that that one looked “cheap” in person… But I still like it better than the white which looks/feels “Lab” sterile to me. Oh, and I LOVE the bamboo towel hooks! What a great way to tie things together and a change from the typical “metal” hooks. Awesome! White Oak–adds needed warmth and texture, ties in with the bamboo hooks (you have to tell us where you found those!). And if I were staging it, I’d be adding similar colored/natural textured items like loofah sponge, wood items like back or nail brush, speckly brown soap, jute or jute look mat to add more organic elements… can’t wait to see what you do here! Whie Oak – looks warmer. Also, the new owner can always paint the white oak if they want it white. White! So fresh & clean!! I like the look of the white oak in these two mood boards. However, if it’s laminate-ish material then I don’t like fake wood-look and would say white. 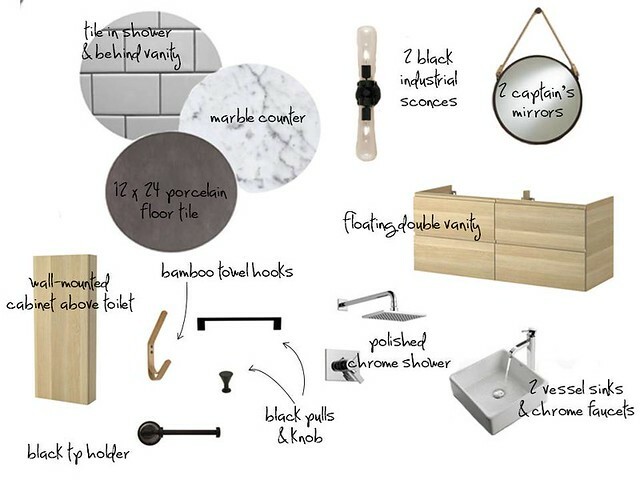 I like the white oak vanity in your mood boards. I think it plays up the mirror and industrial looking sconces more. I would DEF say the white. I feel like it will appeal to more people and age very well. White OAK. Stay ahead of the trend…don’t settle with following the trend…Take this chance! White oak, assuming it doesn’t look like 80s (golden) oak. White is nice and would work, but wood is classic and timeless. White as a trend will probably age well, but will we miss wood in the next ten years? We have white oak floors (from 1929!) and they are beautiful. Not at all like Victorian/Craftsman era oak. Two questions: (1) you’re putting that carera marble on top of the Ikea vanity? does it even look good with the white, shade-wise? I can’t quite get it all together in my head. (2) is your shower tile grey (like it looks), or another shade of white? if you go white, will the grey floor be enough to ground everything, or are you ending up in a World of White? Ha, I’m always behind on these fun voting comments, so I’m going to start stopping by much more often:).